It’s the season when we’re surrounded by hearts – in cards, balloons, candy boxes, etc. Store shelves are draped in pink and red, encouraging us to devote time to sharing what’s on our hearts with those we love the most. But for those who’ve recently undergone heart surgery, thoughts are likely more focused on the recovery process: how long it will take to get back to normal, and what can be done to expedite that process. At To The Rescue, we provide the professional, certified home health care services as well as non-medical care services that help speed the recovery process for heart surgery patients, right in the comfort of home. 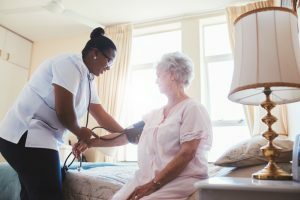 The following frequently asked questions and answers can help those facing heart surgery, or in the midst of the recovery process, to know what to expect and how to maximize healing with the help of a quality in-home care agency. Note that these are general guidelines, and patients should always follow specific recommendations from their medical team. How long will it take to recover? In general, 80% of a heart surgery patient’s healing occurs within the six to eight week window following surgery. What activities are safe following surgery? Upon being discharged from the hospital, most heart surgery patients can manage light tasks and activities, with frequent breaks, unless the doctor advises otherwise. Activities that can normally be performed after discharge and during the first six weeks of recovery include light housework, walking, and climbing stairs. For tasks greater than light housekeeping, To The Rescue provides residential cleaning services customized to meet each client’s needs with a 100% satisfaction guarantee. What activities should be avoided? In the first six weeks of recovery, lifting, pushing, or pulling anything heavier than ten pounds is typically prohibited, as well as driving a motor vehicle. For the convenience of clients who have restricted driving abilities during their recovery, To The Rescue provides comfortable, safe, and accessible transportation services throughout all of our service areas. When can I resume a normal activity level? Typically, between six to eight weeks post-surgery, patients are able to resume most normal activities, including driving and returning to work, unless work duties are physically strenuous. Patients are also encouraged to begin a cardiac rehabilitation program to strengthen and increase the heart’s endurance. After ten weeks, the majority of heart surgery patients are able to resume more strenuous activities, such as jogging, skiing, golf, tennis, etc. For additional tips on recovering from heart surgery at home, and for customized home health services to enhance the healing process, call on the in-home care team at To The Rescue. We can help in a variety of ways, from non-medical care services that allow patients to rest and focus on recovery (such as grocery shopping and other errand-running, housekeeping, meal preparation, transportation, personal care, and more) to a full range of skilled medical care from a registered nurse. To learn more or to schedule a free in-home consultation, you can reach us any time at 720-851-2100 in Colorado, or 319-826-6068 in Iowa.